- First level, first try, i won in 7 tuns, perfect run, and i was surprised it should be in less than 14 turns ! It felt easier than some previous levels. - Second level is suddently very more difficult, i think. 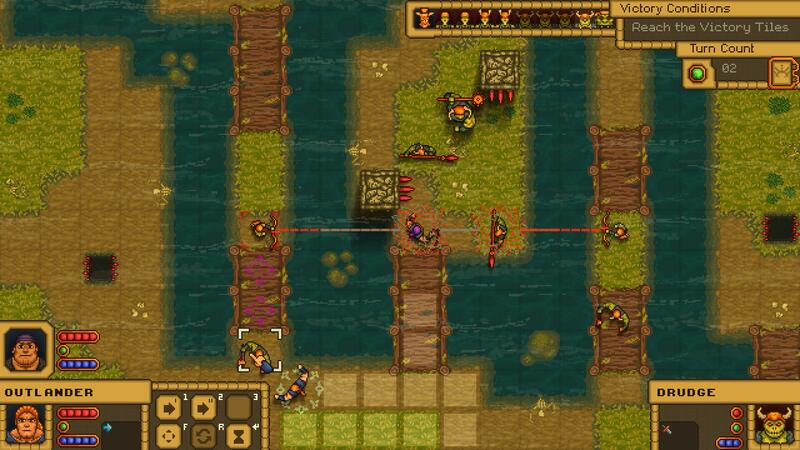 - I think the spear from the Impaler has a nice mecanism, and add evon more tactics than before. I'm curious to see what you will add in the future ! - I think Impaler should not damage the Slaver when pulling an Impaler into a hole. - Would be nice to be able to use as many as different skills we can, as long we have Action Points. A Grapple Bomb, then a Whip, should be possible, as they are two very different skills. First level, first try, i won in 7 tuns, perfect run, and i was surprised it should be in less than 14 turns ! It felt easier than some previous levels. - Seven turns!? That's extremely impressive! Clearly, we hadn't figured out the best path through the level. We'll update accordingly! Second level is suddently very more difficult, i think. - You make a good point. The difficulty progression is a little off in some of the chapters. We'll be going through and tweaking everything in the polish and balancing pass over the next week or two! I think the spear from the Impaler has a nice mecanism, and add evon more tactics than before. I'm curious to see what you will add in the future ! - Thank you! We're very glad to hear you're enjoying the game so far! Rest assured, there's lots more to come! I think Impaler should not damage the Slaver when pulling an Impaler into a hole. - That's an interesting point! We'll take another look at the Impaler spear mechanics. Would be nice to be able to use as many as different skills we can, as long we have Action Points. A Grapple Bomb, then a Whip, should be possible, as they are two very different skills. - We totally agree that being able to use more skills would be awesome! We'll be taking a look at that as part of the character progression overhaul. - Hmmm. That's a weird one. We've added it to the bug list, and we should hopefully have a fix in the mid-week patch! Level 3, the drudge bottom left is not moving far, for some reason it stays in its corner, even when teased... Actually i can't move there neither, the GUI is blocking the passway. - Oh, that is not working as intended. Added to the list of things to fix! When pushing an enemy to the edge of the screen, it should do something. Damage or kill, not just nothing, it doesn't feel "right", in my opinion. - Good point! We'll look into it! So far, i'm stuck at level 3, with the Giant. I manage to kill it, but i also lose one hero. More brain is needed ! - The Giant fight is tough! You can just avoid it and move to the victory tiles, but where's the fun in that? Alright, finished Chapter 4, not with perfect everywhere yet, but i'm out. I really like the game ! I want more ! More !. - Great to hear that you're enjoying the game so far! Fear not, more is coming soon! A Prisoner to save, i hope it's a new hero for next chapter ! - We like the way you think! Interesting things are coming in Chapter 5! I was expecting to play at least one level with all 3 heroes, but i didn't see the Guardian. - We definitely agree that it's time for the heroes to all meet up! I was expecting the Guardian to be in the Upgrade panel, but she is not. - The Guardian skill tree is coming in the character progression overhaul, which should be ready in the next week or two. I was expecting to see more Upgrades but there are not (beside the bomb but it's not upgradable). - We are working on the character progression overhaul alongside the balance pass for Chapters 1- 4, and both will be ready soon! A bug it seems, with an archer. I can't pull or push it. - We've added it to the list! We're aiming for a fix in the mid-week patch. Thank you again for putting so much work into providing us with feedback on the game! It really makes our jobs so much easier to hear firsthand from the community like this! Let us know if you have any more thoughts. We should have another update soon! Awesome! Thank you for taking the time to create a video! It's always really cool to see our community come up with strategies for a level that we hadn't even thought of. We'll update the level objectives accordingly!